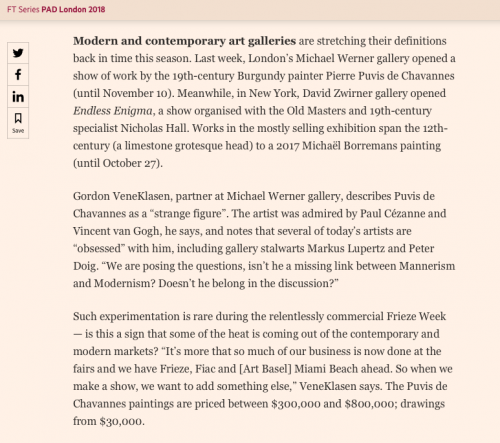 Modern and contemporary art galleries are stretching their definitions back in time this season. Last week, London’s Michael Werner gallery opened a show of work by the 19th-century Burgundy painter Pierre Puvis de Chavannes (until November 10). Meanwhile, in New York, David Zwirner gallery opened Endless Enigma, a show organised with the Old Masters and 19th-century specialist Nicholas Hall. Works in the mostly selling exhibition span the 12th-century (a limestone grotesque head) to a 2017 Michaël Borremans painting (until October 27).